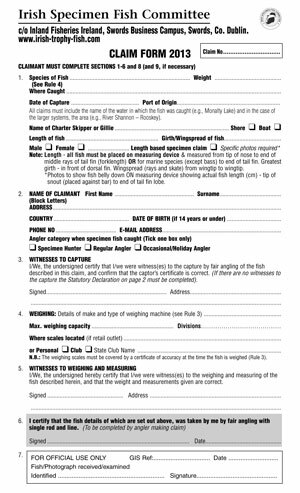 Download the Irish Specimen Fish Committee Claim Form and complete ALL relevant sections. Except in the few cases where a body or presentation of the fish is required for species identification, a series of clear photographs must accompany all record fish claims. The photograph(s) must show the full fish lying on a flat surface and include a measure of scale (measurement mat, ruler, mobile phone, etc.). Preferably it would be photographed on a measuring mat or similar. Supplementary photographs showing the fish being weighed and the recorded weight would assist in further substantiating the claim. Please fill out ALL relevant sections of the ISFC claim form, sign and date Section 6 of the Claim Form and ensure that Section 5, Witnesses to Weighing and Measuring is signed by the witness. If you submitting a scale sample, ensure that they are placed in a dry envelope (NOT in a plastic bag or tin foil as this causes very rapid decomposition). Fish fish details and date should be written on the outside of the envelope. Notify the Committee when a fish is being sent in for identification. Make specific arrangements (by telephone) with the Committee if bringing live fish for identification. Do not forward fish before Bank Holidays or weekends; (keep in a cold store if fish cannot be delivered quickly on or before Friday afternoon). Please attach a label to each fish forwarded for identification giving the captor’s name and address, date and place of capture and the weight of the fish. Fish should NOT be sent in polythene bags or wrapped in aluminium foil as this causes very rapid decomposition.They should be wrapped in greaseproof paper and then in newspaper and brown paper.